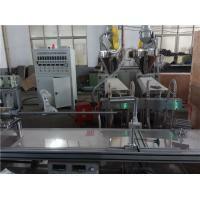 Home Companies Wuxi AJMS Filter Machinery Co.,Ltd. PP melt blown filter cartridge is mainly used in the fields of pure water manufacturing pretreatment, circulating cooling water, drinking water, laboratory water, boiler water, oil field water injection,chemical,pharmaceutical,electroplating,printing,paint,color film processing, fuel oil, beer, beverage industries filtration and so on. 1.Raw material only living up to fiber grade,production line could produce filter cartridges. 2.Inside diameter and outside diameter could according to your request for adjusting. 3.Filter precision could according to your request for adjusting. 4.Length is 10''-100'',this could adjust by cutting machine. 5.Voltage default is 380 V/50 Hz,we make different voltage as your request . 6.If you want to make the special specification filter cartridges, our engineer could devote machine according to your request.